The newts in question are the California newt, Taricha torosa, brown with a yellow/orange belly, and the rough-skinned newt, Taricha granulosa, which also has an orange belly and, as its name suggests, has rough, brown skin. The newts’ orange bellies are warning signs to predators—both species produce tetrodotoxin, a powerful neurotoxin. 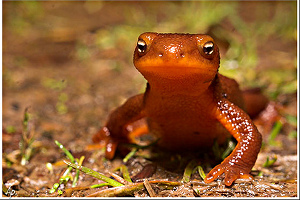 However, the rough-skinned newt’s toxin is ten times more powerful than the California newt’s toxin. 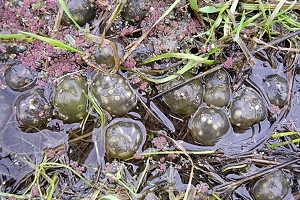 Newts lay egg masses, like these, in ponds and slow-flowing streams. Photo: Jennifer Skene.While these two species are not technically threatened, their habitat has been impacted in recent years: their forests and fields have become our neighborhoods, roads have chopped their remaining habitat into fragments, and the streams and ponds where they lay their eggs have been degraded. The least we can do at this point is refrain from running them over! Newts are amphibians, animals that spend the early part of their life in the water, and their adult life on land. Amphibians are going extinct at an alarming rate; their decline has been referred to as the world’s Sixth Mass Extinction. Habitat destruction is playing a role, but the main problem is an infectious fungus, called chitrid. San Francisco State professor Vance Vredenburg studies yellow-legged frogs in the high altitude lakes of the Sierra Nevada Mountains. He has seen hundreds of frog populations die out because of chitrid. Learn more about Vance’s work and amphibian declines in QUEST’s TV story, Disappearing Frogs, and in a recent New York Times article and accompanying audio slide show. Chitrid hasn’t affected the newts in Tilden, but the closure of South Park Drive reminds us that amphibians worldwide face some serious threats. Jennifer Skene develops curriculum on climate change and ocean sciences at the Lawrence Hall of Science and teaches biology and science communication at Mills College and the University of California Berkeley. She has a degree in biology from Brown University and a Ph.D. in Integrative Biology from UC Berkeley. She started working with QUEST in 2008 as an intern. She has written for the Berkeley Science Review and the UC Museum of Paleontology’s Understanding Evolution and Understanding Science websites.